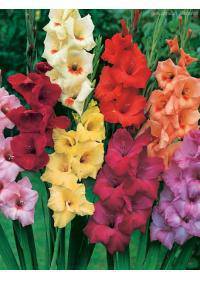 Gladiolus is a perennial bulb with tall stems and fragrant blooms. It is often thought to be a difficult flower to grow in the garden. This is often a misconception as it is a semi-hardy perennial plant. There are many hybrids available, giving far more options for blooms. This creates more options for those seeking traditional or modern. Blooms are available in a wide range of solid and mixed colors. Gladiolus can be found and purchased most commonly in areas around San Bernardino, CA, Aurora, CO, Winston Salem, NC, Antioch, CA, and San Francisco, CA. Choices and assortments depend on each specific region so calling in advance in recommended. The stems are often tall, with multiple flowers present on each one. Some species have more tightly clustered blooms with others sparse. The size of the bloom often depends on the species or hybrid used. Large sizes, such as grandiflora, produce big blooms on thick stems. These are often at least one to five inches across on each blossom. Many of the newer hybrids offer blooms over five inches in diameter. Stems may have up to forty flower buds at once providing ample blooms. Often, only ten flowers may be open at a time due to their size. The stems will often remain blooming for longer periods of time. Some of the modern hybrids also offer ruffles and dense petals. These variations are not often found in more traditional species. These new hybrids are growing in popularity due to their bloom life. Well drained soil is a staple for creating good blooms in gardens. The best drained soil does not form puddles after a heavy rain. Soil that stays damp for too long can cause rot or wilting of plants. Organic compost or material can be added to enrich the soil condition. This can often increase the drainage in problem areas of the lawn. The plant will die quickly if it is left in standing water for long. Full sun exposure is important for the best growing conditions. At least six hours daily is recommended for many of the species. Shady locations may lead to low gladiolus performance or slow growth. Planting at intervals can lead to long periods of blooming plants. This is often a desired result for those wanting a lush garden bed. Clusters of twelve or more are often planted together for display. Container gardening is another way to get colorful displays at home. A deep or narrow container can be used to grow the flowering stems. Shorter varieties may be preferred, though some may use taller ones. For long term color, the glads can be planted with other flowers. Plants that bloom throughout the seasons can provide long term color. This also ensures there are always blossoms available to look at. For indoor displays, the stems can be cut before they begin to bloom. With ample water and care, the buds will open to create a display. Staggered planting can provide many stems to use through summer. The sword like appearance of the stem is associated with strength. For this reason, it is often chosen for those who need strength. This may include the loss of a loved one or an illness or injury. Pink or red bouquets often represent infatuation or passionate love. This meaning makes them a good choice for a new love or renewed one. Gladiolus are used in this way to represent a heart pierced with love.